While France may not be seen as the center of Extreme Metal, it is not surprising that true talent hails from the country as it has always been a hotbed for creativity. Artists have always thought of Paris in particular as a mecca for channeling their inner voice. 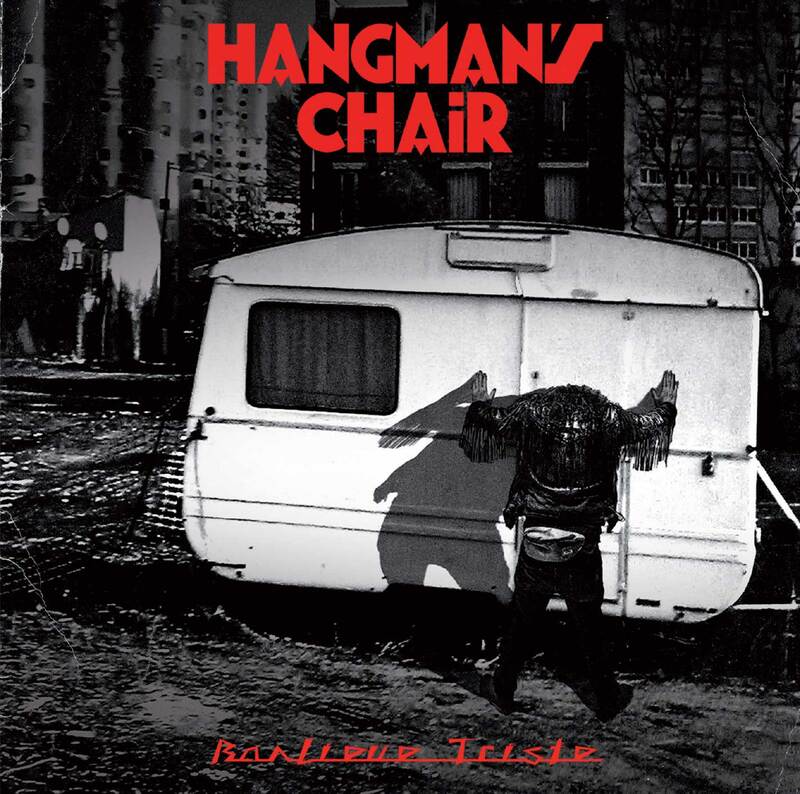 Enter Hangman’s Chair, a band that is trailblazing the very tip of the far reaches of their genre. Forming in 2005, the band have now released their fifth full-length, Banlieue Triste, which roughly means “sad suburb” in French. To categorize the band as Doom Metal is really just a point of reference. Hangman’s Chair have a penchant for crafting surreal songs that tap into the mind’s region of dreams and otherworldly feelings. It is through memorable songwriting sprinkled with the magic dust of the ether that Hangman’s Chair set themselves apart from others. The title track opens the album with a sense of ethereal opulence as clean guitar sets the mood with delay panning from left to right. “Naive” is the first proper track. By combining a mammoth guitar sound with clean, soulful vocals, the band’s statement of intent is clearly laid out. There is a higher order of creativity that seems to be at play for the ringing chords allow the singer to explore different approaches to melody. The third track, “Sleep Juice,” rings even eerier than its predecessor. Contrasting those huge chords characteristic of the genre propelled by judicious amounts of gain with chiming cleans forms the unique formula by which the band exorcises their collective demons. It is this less is more formula that allows the songs to truly open up. One becomes lost when listening as this pensive approach massages the hypothalamus. “Touch the Razor,” the fourth track, is the second-longest on the album at 11:37 minutes. Beginning in somber reverence, lead and backing vocals swirl against each other during the verse section. This allows the massive distorted riff of the pre-chorus to truly stand out. The chorus satisfies with the vocal delivery. There are few singers in the genre that exhibit this amount of soul and emotion. This is fully realized as the album progresses. If a point of reference is needed, the only results seem to be a hybrid of Doug Pinnick from King’s X and Mike Patton of Faith No More and a score of other projects. An extended crescendo formed from the repetition of the clean riff in the middle ties the beginning with a rousing finale that bears its name well, truly sounding like the end, a consequence of touching the razor. Other highlights include the long-running torch of track seven, “Tired Eyes,” and the psychedelic ninth track, “Sidi Bel Abbes”. To achieve the proper effect, though, this must be listened to in its entirety. Instrumentally, the band have a sound that is easily digested. A steady rhythm section provides the ample support needed to propel the two main melody makers, the guitar and the singer. The guitar has a thick, high gain sound that would fit well against the classic sounds of Type O Negative and Crowbar as well. It is crushing, oppressing, but also darkly beautiful, an irresistible danger like some kind of aural narcotic. At times, one is reminded of Silent Enigma-era Anathema while others elicit classic Pink Floyd among others. With the advantage of having such a commanding singer fronting them, the band is set apart from their peers. Truly no one else sounds like this band. Building upon their dreamy sound, the band also use space to their advantage. There is almost a loose nature that ties notes, chord changes, and sections at large. Hangman’s Chair allow their music to breathe which in turn actually garners a more invested audience as every note is able to be carefully dressed in whatever color so deemed by the musicians. It is also not difficult to interpret how the band wants the listener to feel. There is so very much feeling running through the course of this album. One enters a personal dream quest set to these songs. It is this feeling that makes this album timelessly classic.